Keen cyclist and bought a 2018 F pace last summer. Does anyone else use this setup? If so what is the maximum number of carriers fitted? The Accessory brochure specifies that a maximum of 3 carriers can be fitted to the bars. Ideally, I'd like to fit 4 so that team mates and I can all travel in the same vehicle. The brochure suggests that each bike can be up to 20 kg. The bikes I'm looking to transport will weigh less than half of that amount. i'm confident and extra carrier and a bike would keep things within the total roof weight restriction but unsure if other factors should be considered? Wind load? physical space? Any experiences that can be shared? Possibly not much help after your purchase, but std Thule feel and bars provide far more fitting “width” than the Jag branded items. I’ve only had a roof box on the F-Pace but I have had 2 bikes + roof box on these same bars, on top of a Disco4. Four bikes would have worked without issue. Thanks, I had three on at one point last year and it looked like there would be room for a 4th. Hi, probably late to the conversation but in the manual I think it specifies a maximum of 75KG on the roof including bars? I guess as long as you don't exceed that you should be OK.
My personal issue with the roof is that it's so high, I couldn't imagine getting a bike on and off, I would be worried I'd damage the car. The good lady has a tow bar on her Rav4 and we have a Buzz rack for carrying our bikes, that thing is awesome and so safe. I’m an off-road rider, so transport my bike to where I want to ride it. I’m 6ft 2” tall, and had no problems using Thule bars on a Golf - other than the stream of muck that slid across the roof and down the windows when driving! When I moved to an SQ5, I felt putting the bikes on the roof had an element of danger to it! I was worried that I’d slip or drop the bike and cause significant damage to the car / bike. I had the factory fit stowable towbar fitted, and bought a 4x bike rack. Not only is is much easier to fit, safer, aerodynamically better... but the muck now drips onto the ground behind me! 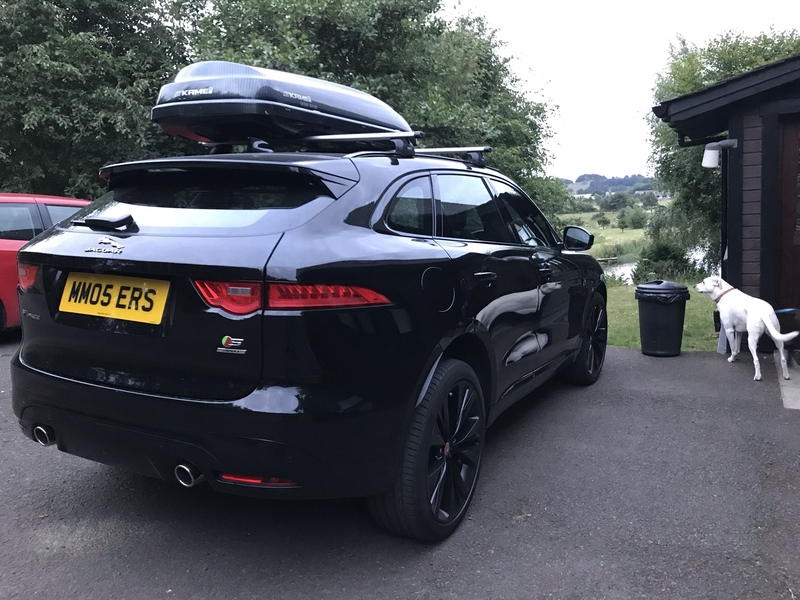 I had my F-Pace fitted with the electronically deployable tow bar. Press a button, and it pops out 20 seconds later. Cycle rack takes about a minute to hook up, and my bike takes another 2 mins on top of that!